Family Leisure is proud to introduce Presidential Billiards to our already long list of pool table manufacturers. What does this innovative billiard company bring to the table? Simply put, Presidential Billiards offers the very best designs combined with the best materials and construction. Just a quick view of the Presidential Billiard Tables for sale (view all Presidential Billiards here) and you can see they touch upon every style, fashion, trend and finish available when it comes to pool tables. In fact, we challenge you to find another manufacturer that offers a different look than one of the many table designs offered by Presidential! It starts with a selection of the very best materials. For Presidential this typically mean solid African Mahogany or Tropical Conifers when it comes to the frames, legs and cabinets. Starting with such solid materials is crucial in creating a heirloom-quality piece of furniture that can be passed down to children or grandchildren. While a great attribute everybody wants in a pool table, the quality materials mean nothing if the pool table itself looks substandard. 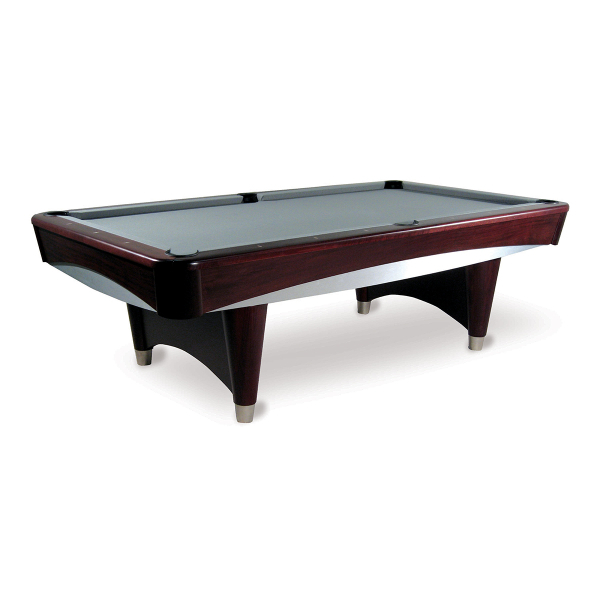 The trained designers at Presidential Billiards ensure your new table will be the "Commander In Chief" of your game room, basement or billiard room. The bottom line is a pool table is the centerpiece of a room, sometimes the centerpiece of your home, so it must look not only good but great. Remember, every visitor to your home will see the pool table; they can't miss it! In fact, many visitors will be getting up close and personal with your pool table, so it's crucial the design is second to none. The skilled craftsmen and designers at Presidential ensure the finest designs and concepts. Classic furniture elements such as ball and claw feet, ram's head legs, French furnishings and other traditional elements can be found in many of the pool tables. 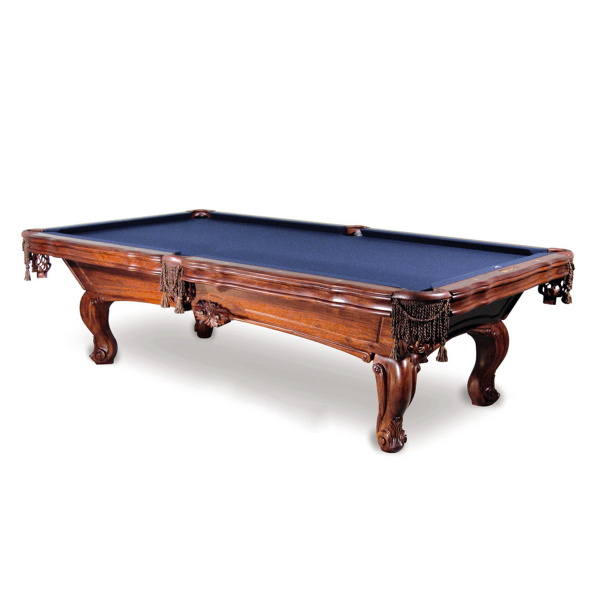 Distressed or weathered wood for character; hand-turned baluster legs; Mocha, Chestnut, Mahogany and other classic finishes; we promise you will find a traditional and classic example of furniture when it comes to Presidential Billiards! Looking for a contemporary table? Pick a model with curved pedestal legs or an exceptional Asian-inspired design for that modern look! Enough about the designs and materials. Let's discuss the construction techniques utilized by Presidential Billiards. First, nothing but one-inch slate (or thicker) is used on Presidential Billiard Tables. This is the preferred surface played on by professional pool sharks around the globe. Supporting this slate is dual or quad-beam construction, distributing the slate which virtually eliminates sagging, keeping the level extremely flat. If you desire the smoothest gameplay, this is the surface you want. Every side rail cushion is made from natural gum rubber and features a K-66 profile. The K-66 profile is used in professional tournaments and is approved by the Billiard Congress of America (BCA) for precision and accuracy, along with the added benefit of longevity. And the cushions are safe and secure. Each rail is attached to the slate using a sturdy T-nut bolt system that creates a seamless connection. You can trust Family Leisure with your pool table investment, whether it's a Presidential Billiard Table (view Presidential Billiard Tables here) or another brand. Why trust just another website? Family Leisure offers physical locations with actual customer service departments; we have established relationships with these pool table brands, ensuring a response from a manufacturer, just in case anything goes wrong with a warranty. View All Family Leisure Pool Tables here. And we have established the largest network of pool table installation crews in the nation; if one of these local installers offers sub-par service we immediately drop them from our list. This ensures your investment offers high-quality gameplay forever!